A quick look at the interior of the finished jacket. The lining is a silk crepe de chine by Carolina Herrera, found on emmaonesock.com, a website that offers, among other things, leftover yardage from high-end designers. After I finished the interior steps outlined in the previous post, I constructed the lining and fell-stitched it to the front facing, neckline, center front and hems, enclosing all of the busy work inside. 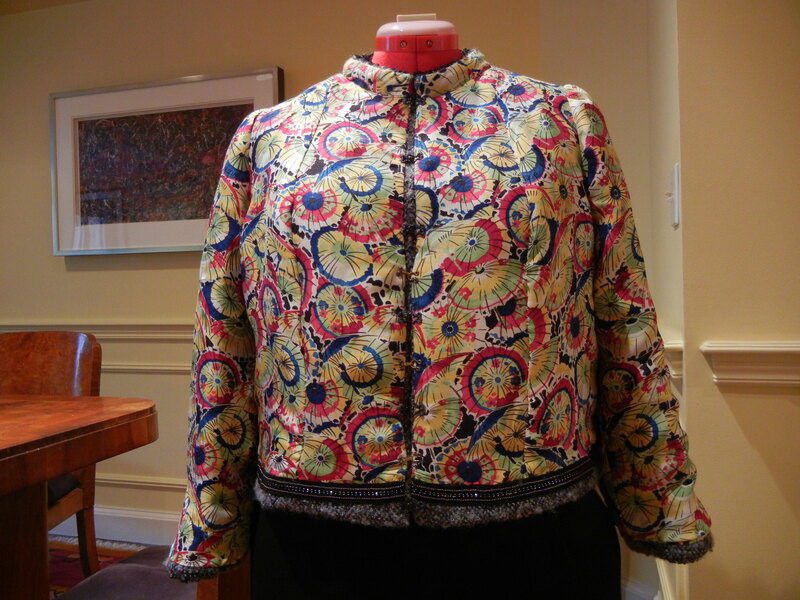 I always like the “surprise” of the bright linings stitched into these vintage Chanel jackets, which remind me of how chic, put-together French women have their look thought out down to their meticulously chosen, gorgeous (and mostly hand-wash only) lingerie. I personally witnessed the French ritual of selecting lingerie one Saturday afternoon in the tiny, tony Eres shop on Paris’ rue de Cherche Midi. While I was attempting to squeeze my American behind into the largest size of their minimalistic beachwear, the saleswoman, in typical French fashion, would periodically throw the curtain wide open and loudly give her unvarnished opinion of how each style was or wasn’t working on me. The scene was different in the neighboring dressing rooms, though, which all had men stationed outside. I finally realized that the French women in the changing rooms were all trying on various 200 Euro bras made of about 20 centimeters of tulle, then getting the yay or nay from their lovers outside the curtain, who were standing all of 3 feet away from me while participating in this discreet form of foreplay. Um, where was I? The chain weight on the hem of the jacket is just the best cheat, which I found at Mood Fabrics’ new locale in L.A. It’s a chain that is cleverly woven into a twill tape. So rather than the oh-so-laborious hours sewing on of the traditional Chanel chain weight, when you are so over making the jacket, you just machine the twill tape on about 1/2 below the unfinished hemline, then turn up the hem and catch-stitch it in place before fell-stitching on the lining right above the chain. It’s worth putting on the chain to counterbalance the lightness of the jacket, and this method makes it much easier. All that’s left is a row of hooks and eyes down the front, then the joy of wearing it.